All the rooms of Sorrento Babyluna are new in the structure and in the furnishings; bath with shower and Hairdryer is inside or beside the room. All the rooms have kitchen corner, air conditioned and TV color. 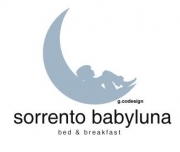 The Bed & Breakfast Sorrento Babyluna is a practice alternative for the one who wants to visit the Sorrento Amalfi Coast without renouncing to the elegance and the comfort of an hotel with the rates of a Bed & Breakfast! Let you cuddle from the care of the details, from the courtesy of our welcome, from the comfort of a modern and equipped residence: an ideal way to live a marvellous holiday in Sorrento. The apartment has been restored in 2007, to offer to our guests a nice, modern and friendly ambience, with all comforts. You can arrive to Naples with ‘Ferrovie dello Stato’ trains from any city in Italy. Then from the Central Station, leave the Circumvesuviana Trains , in direction of Sorrento about avery 30 minutes. The railway stop Sorrento is 300 mt far from Sorrento BabyLuna.